The flex pipe is torn on the wife's car and I was going to tackle it this coming weekend I checked autozone.com and they show 3 different part numbers for "front pipes" all made by walker. Will they all fit, I have read that some aftermarket brackets are in the wrong place, I want this to be as painless as possible... Does anyone know what the proper part number is to fit this 1998 4 door, 4 cylinder, EX, Automatic, ULEV? What model trim: DX, LX, EX? Automatic or Manual? It may not make a difference; but, is this a ULEV or non-ULEV engine? I can't find a cross-reference chart for the Walker exhaust pipe. But, since it is a ULEV (California was the state where the ULEV were primarily sold), it most likely is the Walker 53541 for 1998 EX, AT, California. 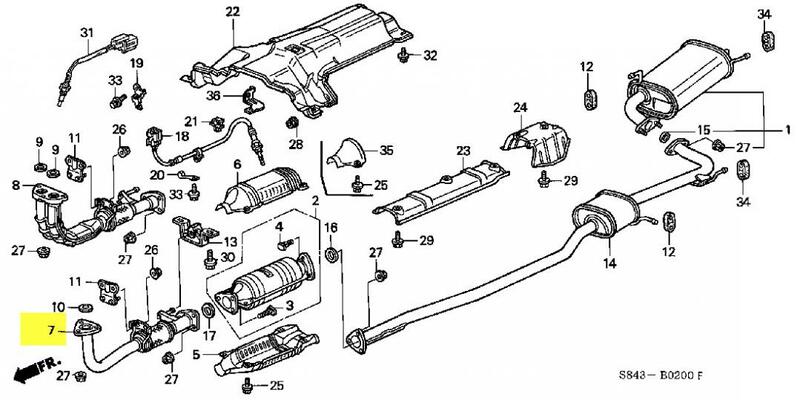 The Honda superseded part number is 18210-S84-L11. In my research I found that a review on amazon (Amazon.com: Walker Exhaust 53541 Front Pipe: Automotive) that said the Walker Exhaust 53541 Front Pipe didn't fit his 1999 California emission due to the bracket being off. Should the 1998 and the 1999 be the same? The Honda parts sites show the 1998 and 1999 use the same Honda part number for that piece. Can't really say much about Walker as that is what is listed on their website and they do not have a cross-reference chart available. It may even be a manufacturer fault on the Walker part. Last edited by redbull-1; 06-25-2012 at 10:08 PM. How about a cross reference for Bosal exhaust? Is there a way to check for sure that my car is a California emission car? Although Bosal has a cross-reference search feature on their site, it did not return any cross-reference search results for that part. Honda's part site show ULEV as California emissions. However, to check, refer to this Rockauto link to check for the emission label. The flex joint is part of the "A-pipe" that goes under the oilpan. Non-ULEV engine has a 4-into-2 manifold, so the A-pipe has double inlet. Part #8 in this drawing. ULEV engine has 4-into-1 manifold, so the A-pipe has a single inlet. Part #7. That's a pretty big visual difference, so maybe you can order on the phone (not on-line) and ask the guy to ACTUALLY LOOK AT THE PART. For that matter, look at your pipe and verify it too. The fit problem seems to be in the bracket before the flex that mounts to the block. I think I am just going to order the CA and non CA and return whatever one does not fit.